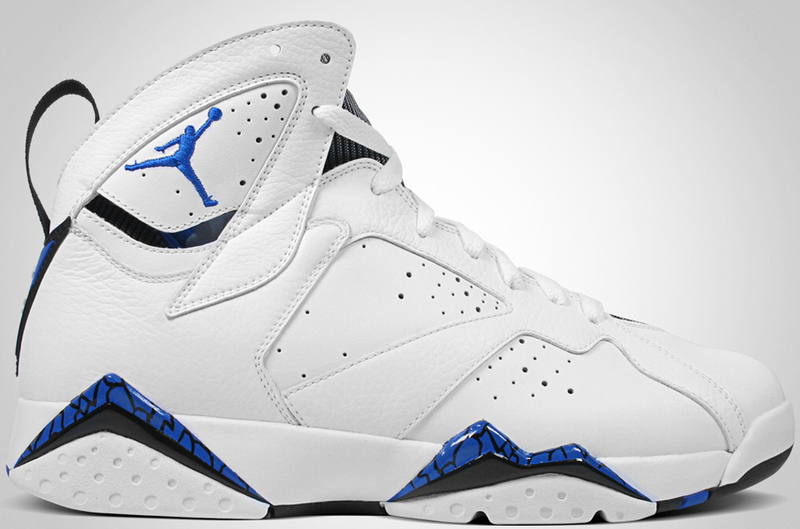 Today we take a look at the history of the Air Jordan 7. 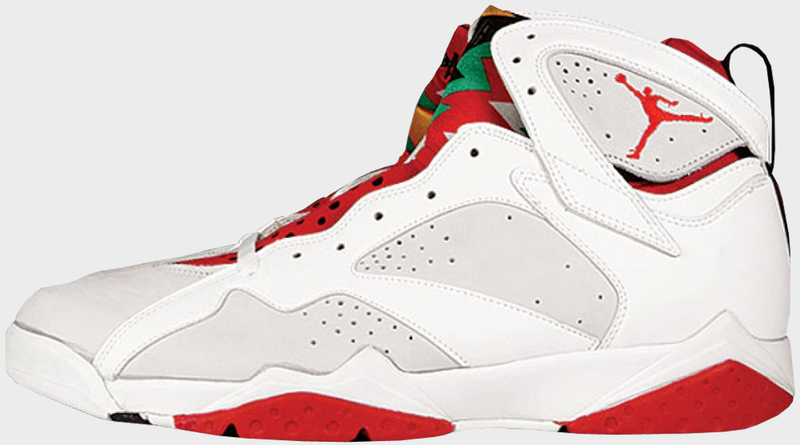 The Air Jordan 7 originally released in 1992 and was once again designed by Tinker Hatfield. 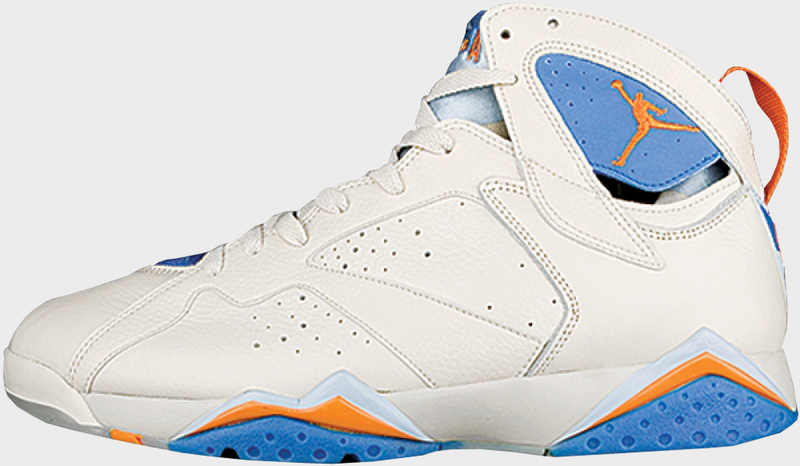 Unlike the previous four models, the 7 did away with the visible Air unit in the heel and "Nike Air" logo on the heel. 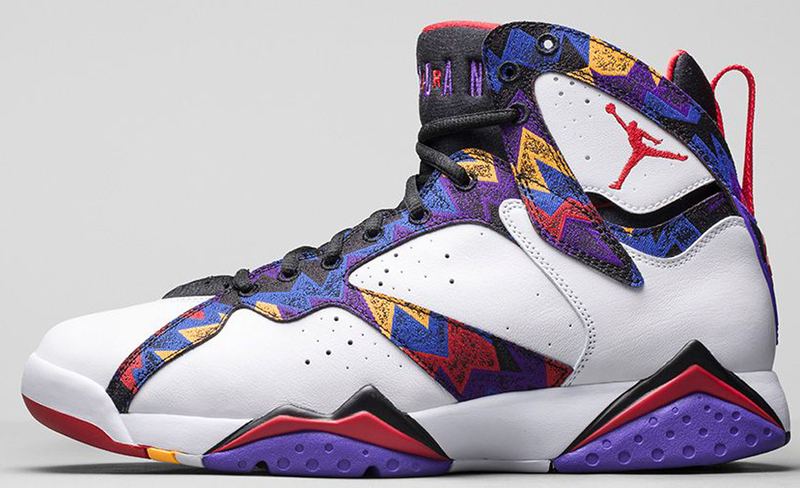 They featured a Huarache-like neoprene inner bootie and colorful geometric detailing inspired by West African Tribal culture. 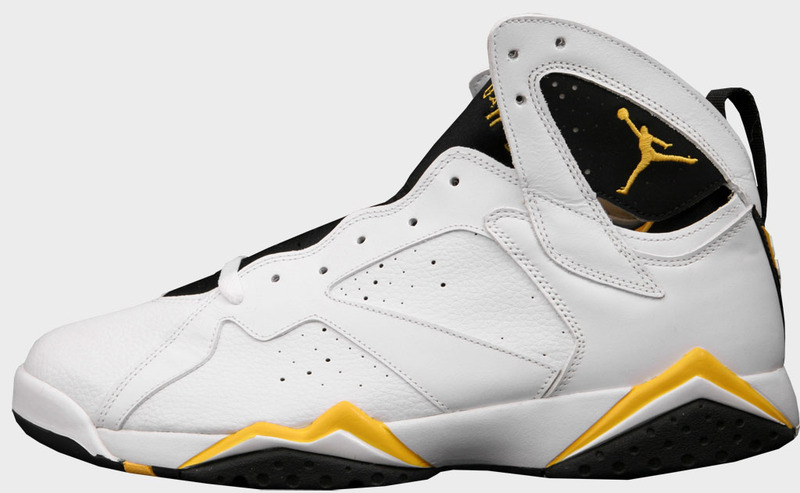 Five original colorways of the 7 were released, including the first Olympic-inspired version, which Michael Jordan wore during the 1992 Summer Olympic Games as a part of the "Dream Team." 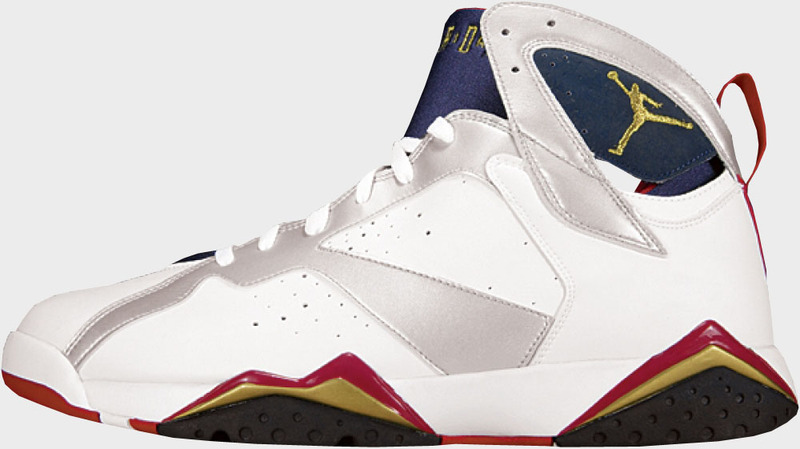 This pair also featured Jordan's Olympic number "9" in place of ‘23’ on the back triangle piece. 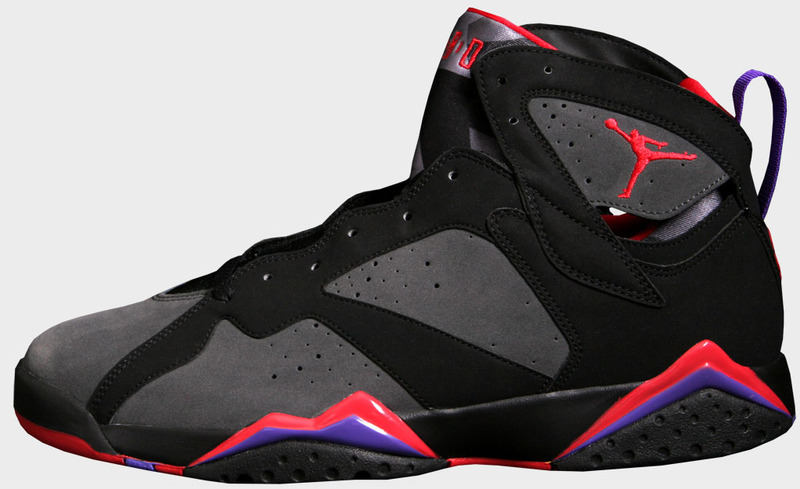 The Air Jordan 7 Retro made its debut in 2002. 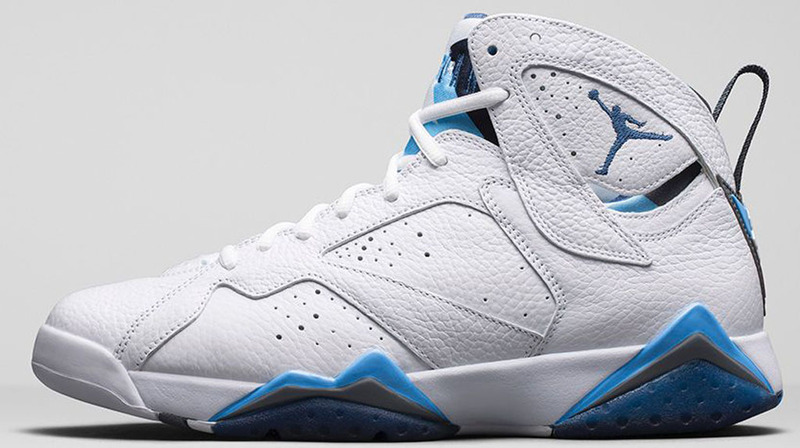 It was short-lived, as only two colorways were released. 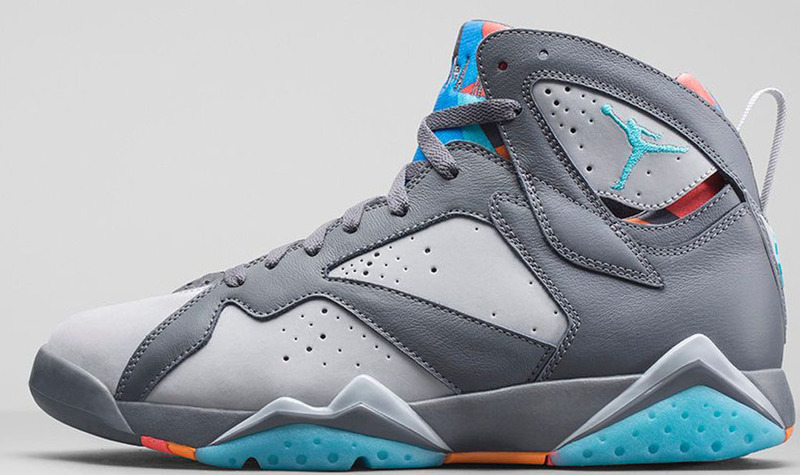 One pair came in the original "Charcoal" colorway, while the other came in an all-new Retro+ style. 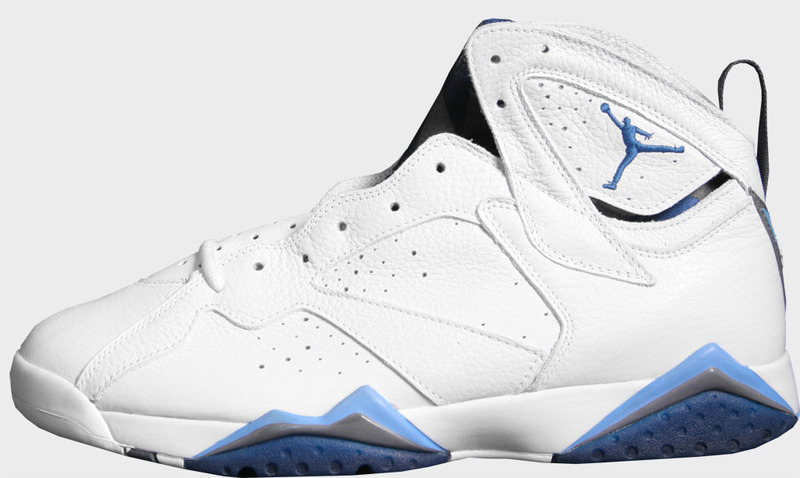 This version, the "French Blue" edition, brought the first new colorway to the model since it was originally released and also featured a new leather tongue. 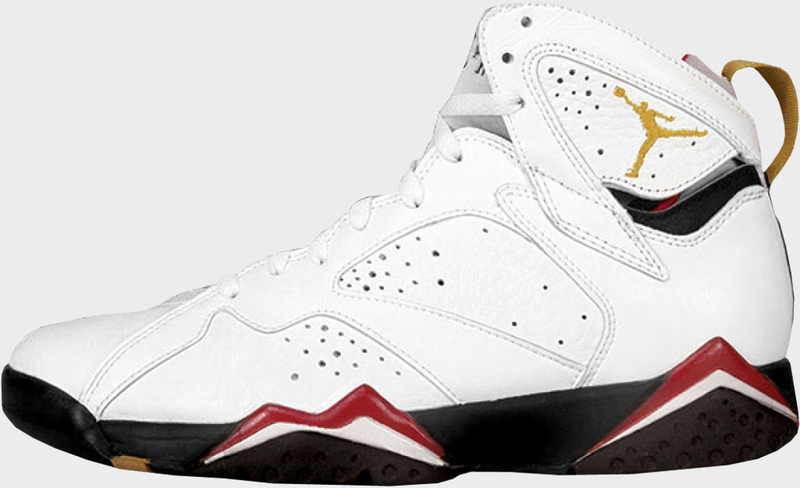 The 7 Retro returned two years later 2004. 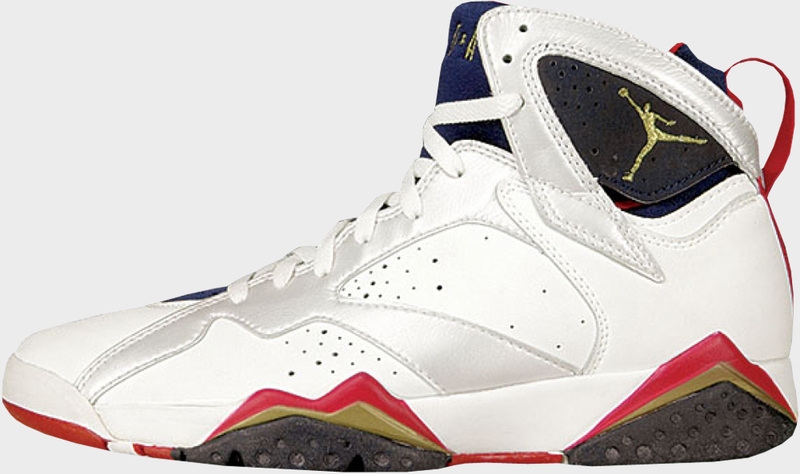 This one-off release release saw the the original "Olympic" colorway come back for the first time. 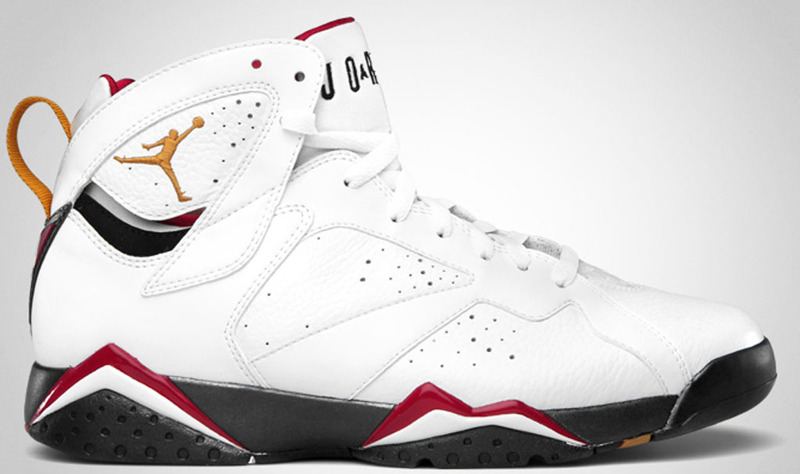 In 2006, the 7 Retro would finally get a full run, with six colorways releasing. 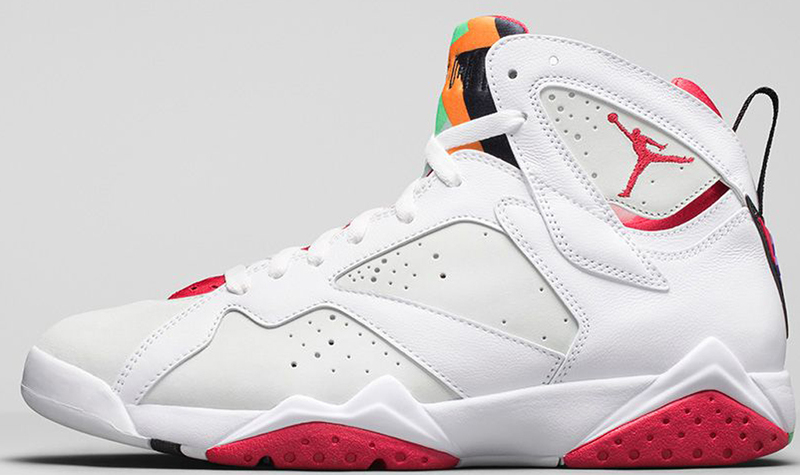 The run started off with two "LS" editions, followed by the return of the original "Cardinal" colorway and an all-new women’s exclusive. 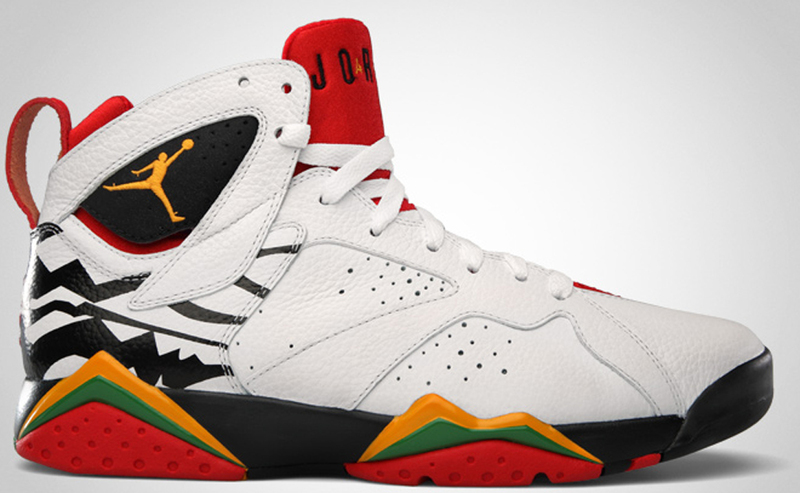 In 2008, the original "Hare" colorway returned as a part of the Jordan 16/7 Collezione "Countdown" Pack. 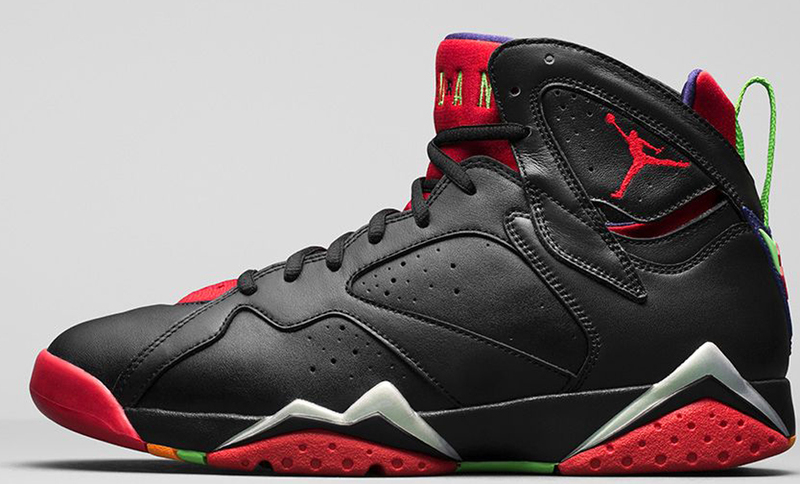 Also releasing that year was a limited "Olympic Celebration" colorway inspired by Joan Miro, a famous Spanish painter. 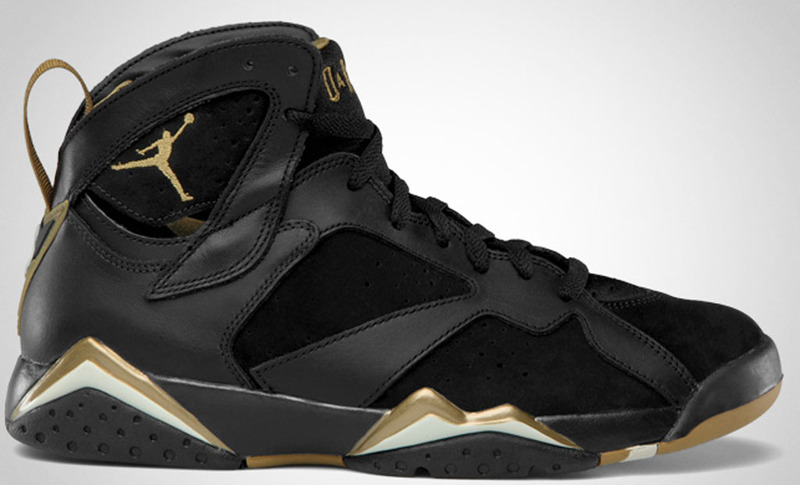 The following year saw the the 7 release in two colorways for the second "DMP" of the year. 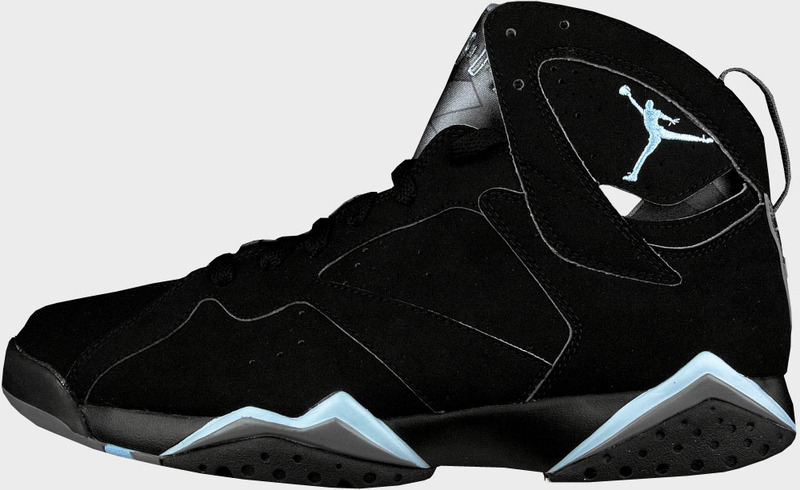 Made to commemorate Michael Jordan’s 60+ point game against the Orlando Magic in 1993, the pack included the OG ‘Charcoal’ colorway representing the Bulls, along with a new white, royal and black colorway for the Magic. 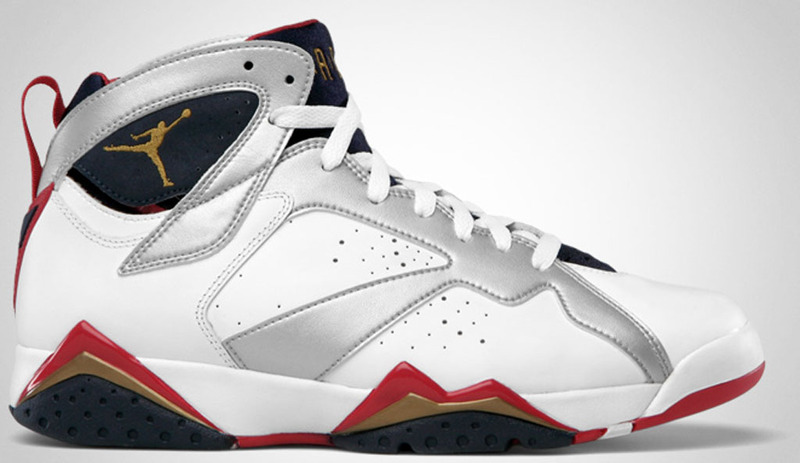 For the World Basketball Festival in 2010, Jordan Brand brought back the "Olympic: Air Jordan 7 Retro for the second time. 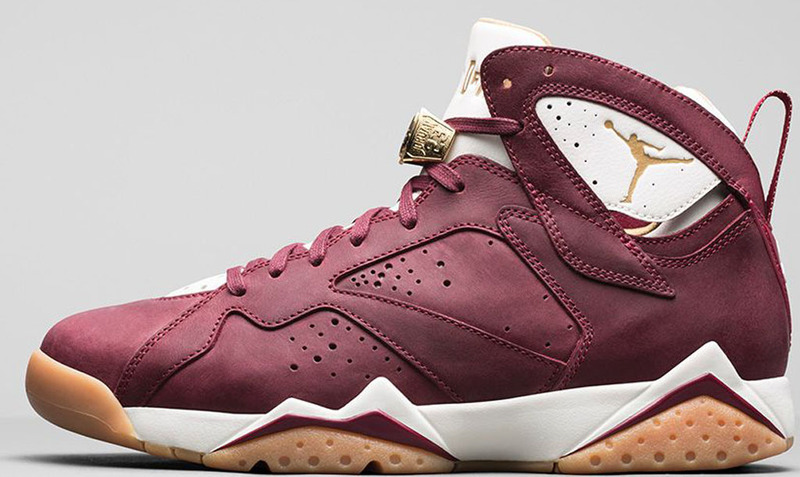 This time, they featured a gold heart-shaped "For The Love Of The Game" logo embroidered on the heels. 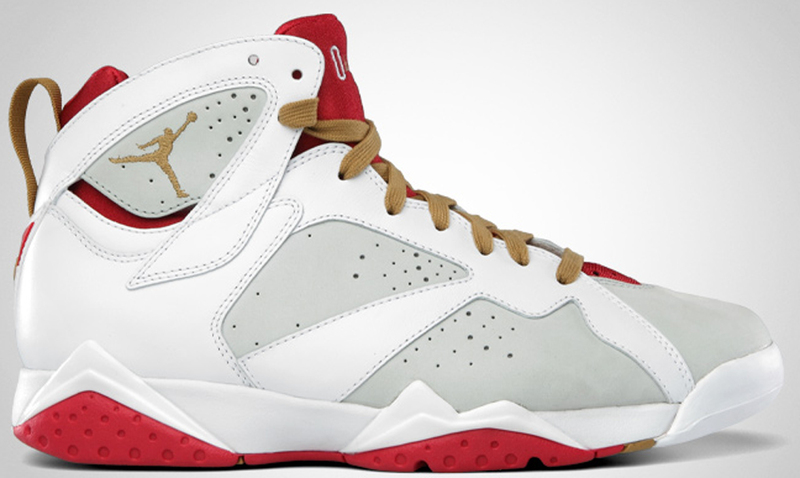 Also released in 2010 was an all-new Premio colorway, which was the third release from Jordan Brand’s "Bin23" Collection. 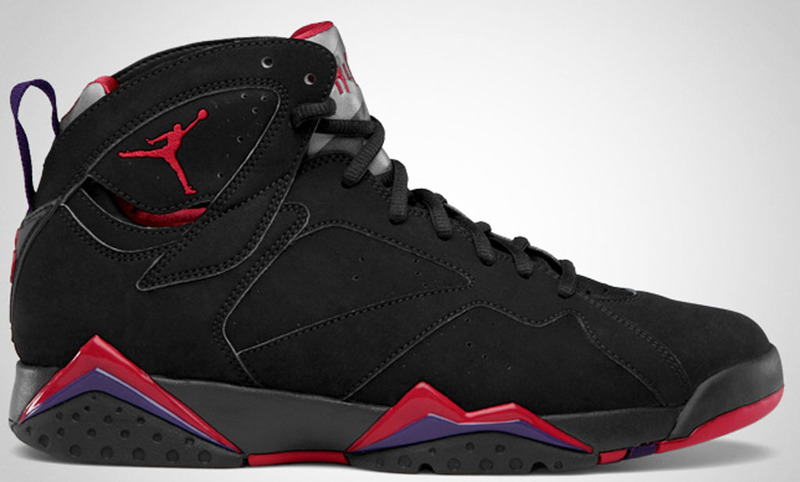 In 2011, the Air Jordan 7 Retro would have its second full run with four releases. 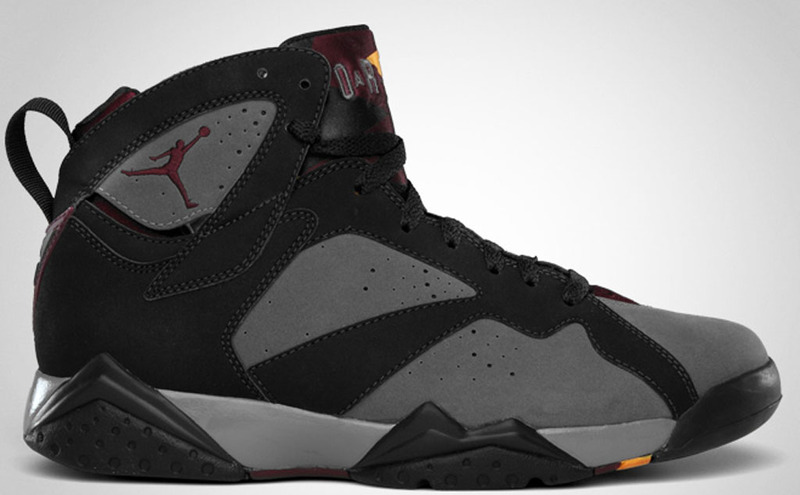 The original "Bordeaux" colorway, one of the year's most popular releases, was retroed for the first time. 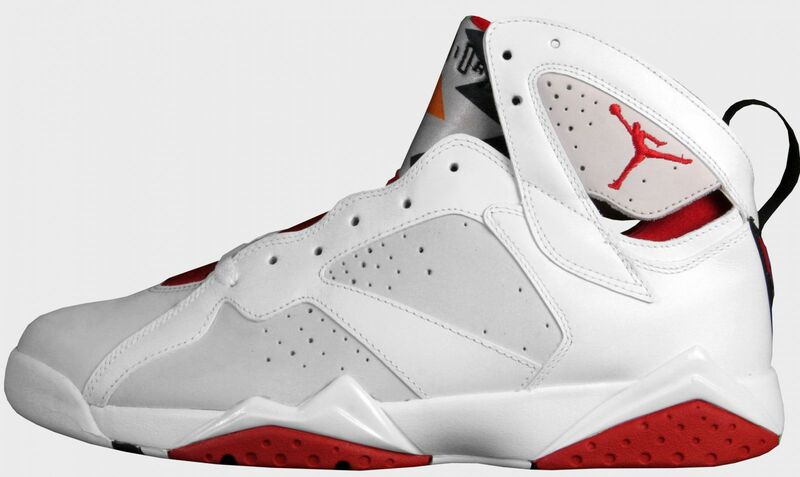 Additionally, the "Cardinals" saw another re-release, along with two new colorways, including a "Year of the Rabbit" edition inspired by the Chinese zodiac. 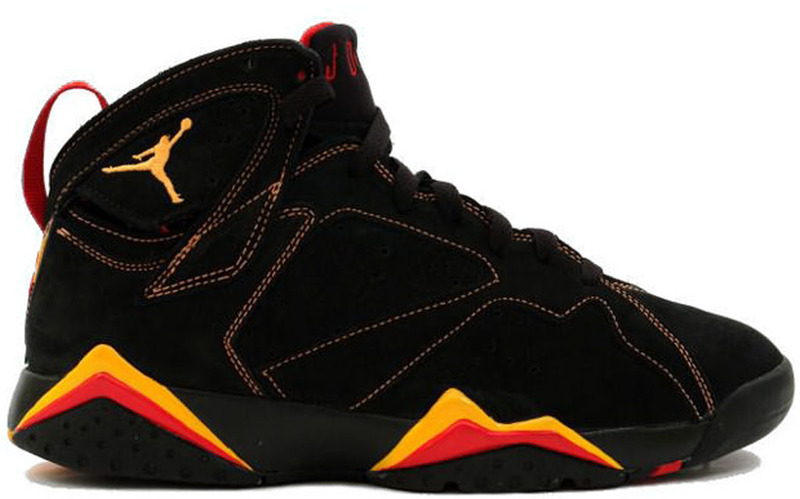 The Air Jordan 7 Retro came back again one year later in 2012 with a five colorway run. 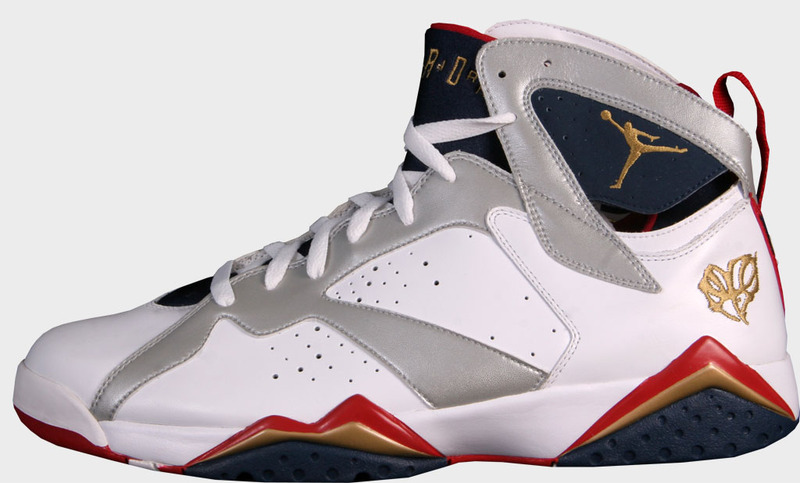 Jordan Brand brought back the "Olympics" for a third retro, this time true-to-the-OG (sans the "FTLOG" logo on the heels). 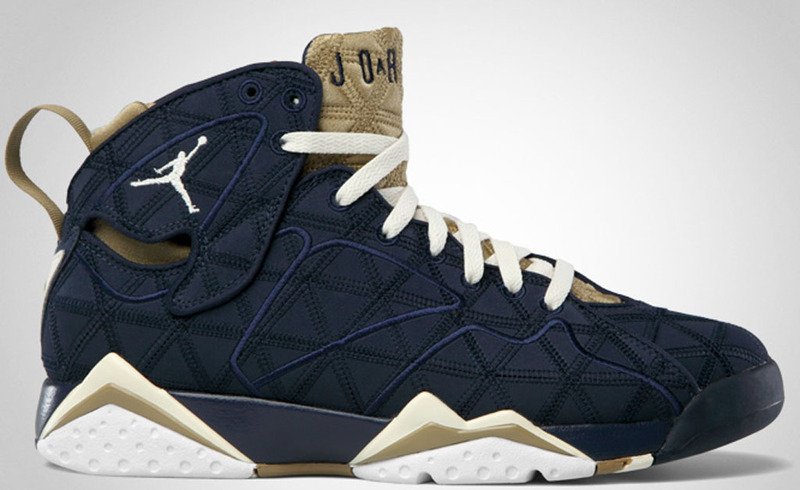 Also, two "J2K" editions were released featuring redesigned woven uppers. 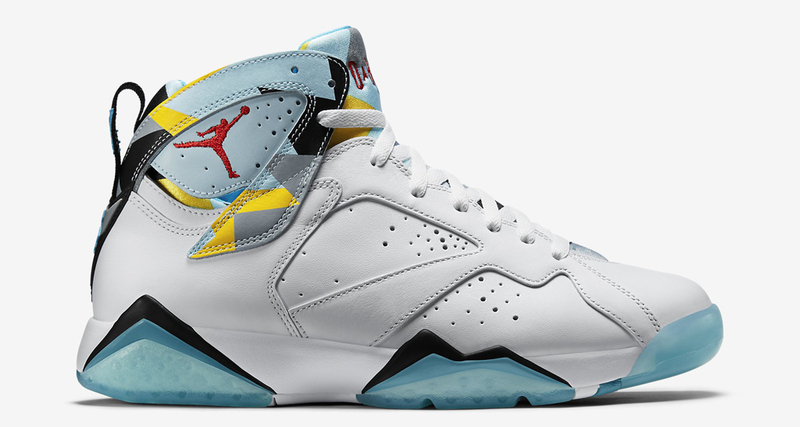 Paying homage to the 20th Anniversary of the 1992 Summer Olympics, a "Golden Moments" Pack was released, featuring both the Jordan 6 and Jordan 7. 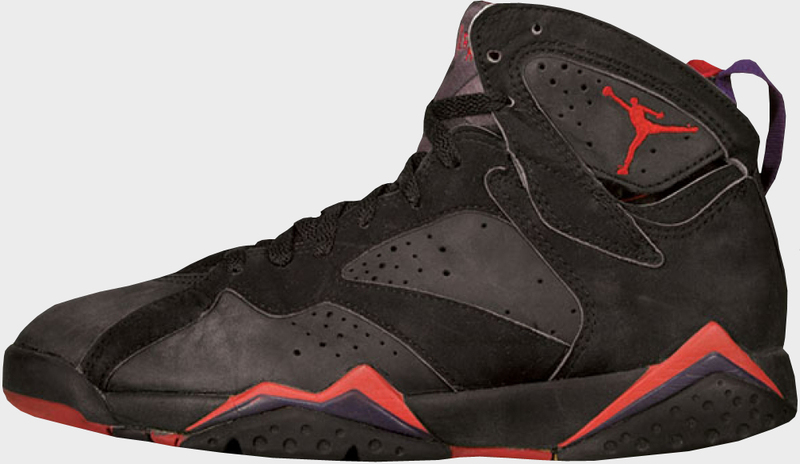 The final 7 Retro of the year was the third "Charcoal" re-release. 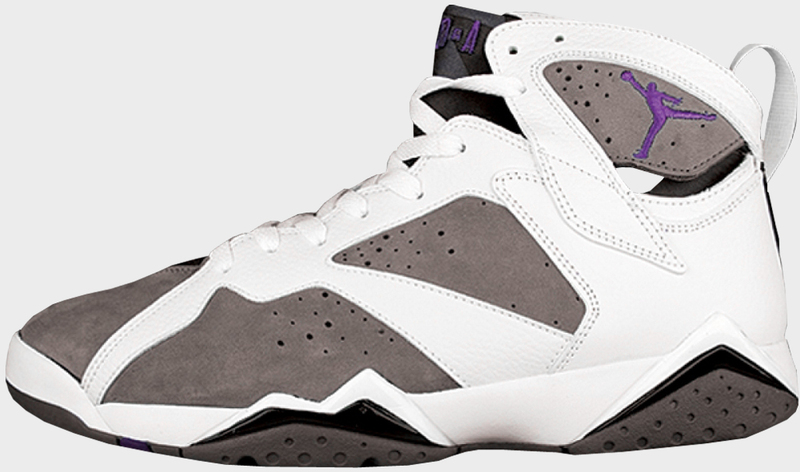 Take a look at the history of the Air Jordan 7, from its first release to the most recent. 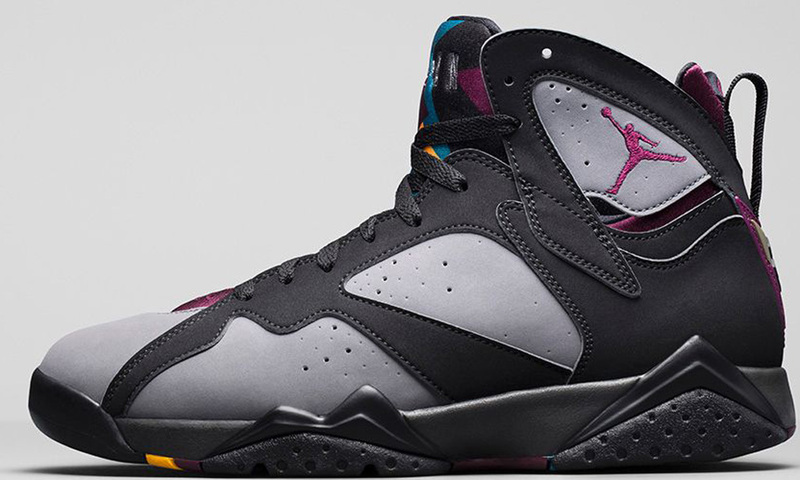 Air Jordan VII OG "Bordeaux"
Air Jordan VII Retro "Charcoal"
Air Jordan VII "Pacific Blue"
Air Jordan VII Retro "Cardinal"
Air Jordan VII "Flint Grey"
Air Jordan VII Retro OC "Miro"
Air Jordan VII Retro DMP "60+ Magic"
Air Jordan 7 Retro "FTLOG"
Air Jordan VII Retro "Orion Blue"
Air Jordan 7 Retro "Cardinal"
Air Jordan VII Retro J2K "Filbert"
Air Jordan 7 Retro GMP "Golden Moments"
Air Jordan 7 Retro "Charcoal"
Air Jordan 7 Retro 30th "French Blue"
'Air Jordan VII Retro 30th "Barcelona Nights"
Air Jordan VII Retro C&C "Champagne"